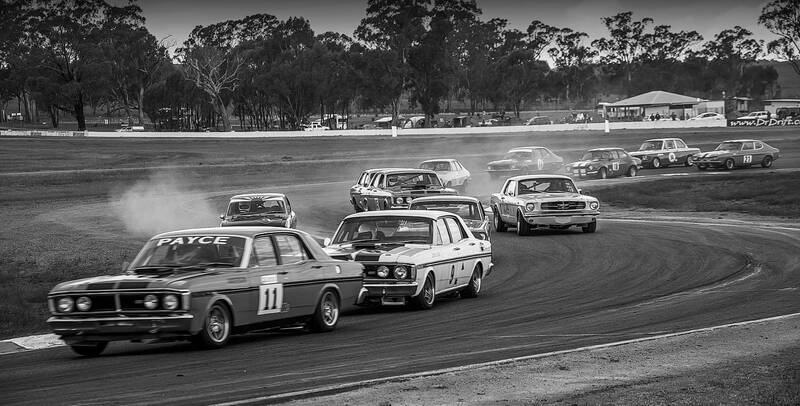 The story of Winton Motor Raceway, which is today Victoria’s oldest continuously operating racing circuit, had its origins back in 1957 when Bruce Watt, a school teacher from nearby Benalla, founded the Benalla Auto Club with an initial membership of 20 people. The clubs first organised activity was a gymkhana on December 1st, 1957 behind Terrett’s Sawmill in Roe Street Benalla. The Club’s next step was to establish an oiled-dirt 0.9 mile circuit at Barjarg, 50km from Benalla on the Strathbogie Road. The site was a rugged one, with a rocky outcrop in the main straight which took skill to negotiate. However the meetings at Barjarg were popular club affairs with plenty of races crammed into the afternoons, the first of which took place on 25th January, 1959. Given the shortcoming of the venue, the circuit was never going to progress into significance, and with the BAC buoyed by the enthusiasm (and with the profits generated from each meeting), plans were laid to look for a more suitable location for a new circuit. On 23rd June, 1960 plans were announced for the establishment of a permanent motor racing track on what was then known as the Winton Recreation Reserve, with a projected opening meeting in early 1961. However when work lagged behind schedule, one further meeting at Barjarg was conducted, on April 9th, 1961, this time as a benefit for the family of the former president of BAC Ormond Allison, who lost his life in an accident while working on the construction of the Benalla Go Kart track. Winton’s opening meeting finally took place on 26th November, 1961 followed rapidly by bigger and better meetings, including Victorian Championship rounds for various car categories. 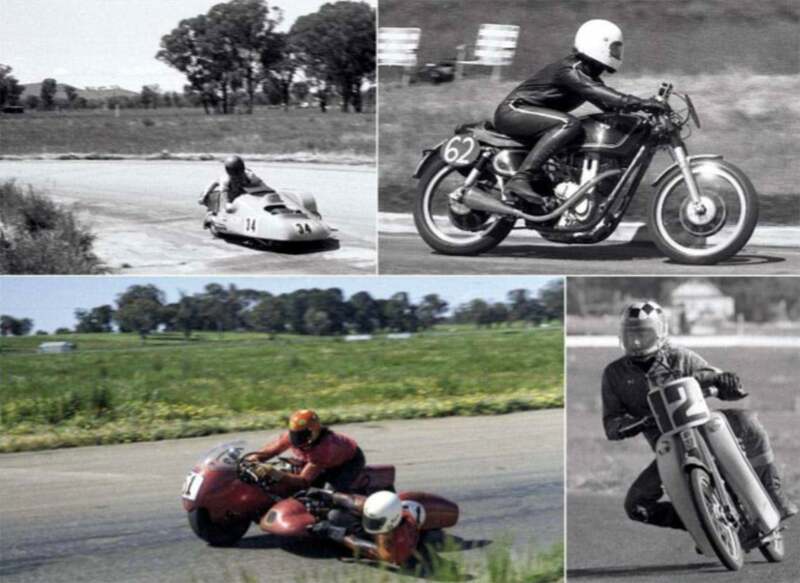 It was to be some time however before motorcycling came to Winton, as the two and three-wheeled community were well served with venues at Phillip Island, Ballarat, Darley and Fishermen’s Bend. The traditional New Year’s Day meeting at Phillip Island was set down as usual for 1963, but the track, just over six years old, was now in ruins, successive runnings of the Armstrong 500 race for touring cars having destroyed the track surface. Hartwell MCC, promoters at Phillip Island, was faced with a last-minute dilemma to find an alternative venue, and quickly began discussions with the BAC. Top Left: Dennis Skinners 810 Honda outfit in 1974. 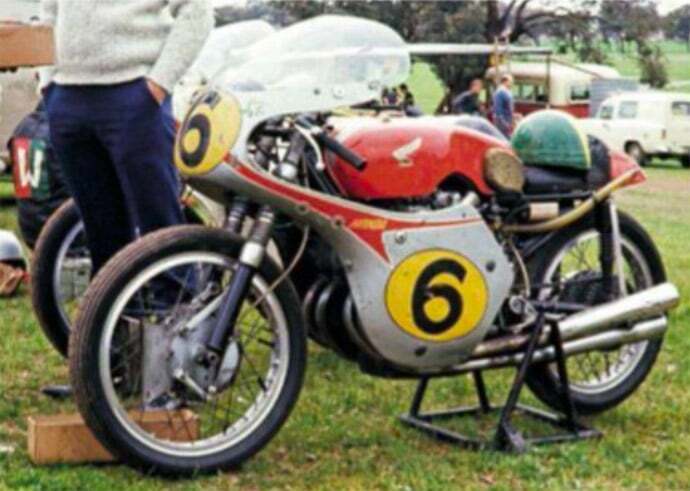 Top Right: David McLennans 7R AJS in the AMCN Trophy of 1974 – one of the earliest historic racing events to be held. Bottom Left: 1974 shot of Gavin Porteous and Darrell Decker. Bottom Right: Seems like Graeme Laing wasn’t the only man to race the Suzuki Step Through as this 1974 shot shows. 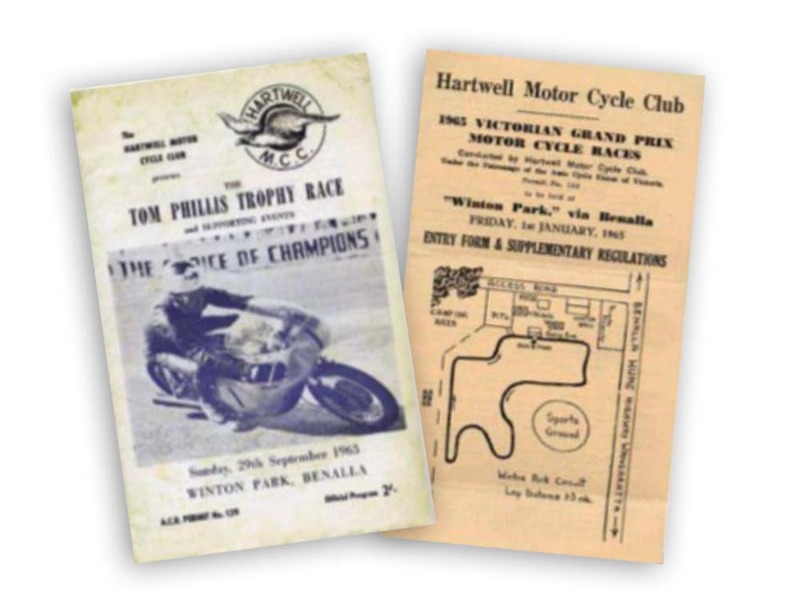 In its first taste of motorcycle racing at their track, the BAC was certainly impressed by the huge crowd that flocked into witness an 18-race program. What greeted the all-star entry which saw international Eric Hinton up against home-state hero Ken Rumble, local stars Allan Osborne, Barry Smith, Ron Robinson and Alan Hopkins, South Australian Peter Richards and all the leading sidecar crews, was a 1.26 mile track laid out of fairly flat grazing land, beside the Old Hume Highway halfway between Wangaratta and Benalla. Ten corners had been jammed into the layout, the signature being a sweeping left hander that tightened into a hairpin at the far end of the circuit, originally referred to as the Water Tower. Although there were many outstanding performances, the star of the day was Eric Hinton, who took three wins including both the Junior A and Senior A Grade races. 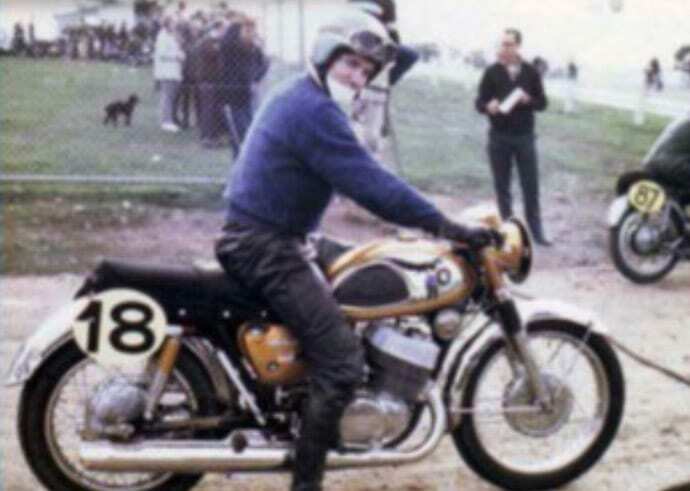 In the Senior, Hinton and Rumble (who finished a close second) were credited with the first outright record for motorcycles at 1 minute 19 seconds. Richards took out the 250cc race and Osborne the 125. The first of the two feature races, the Junior GP over 12 laps, went to Rumble after Hinton ran off the track on the third lap. In the Senior GP, Hinton made no mistakes, winning the race (shortened to 10 laps with daylight fading) and lowering the lap record to 1.18. The action was no less frantic in the graded races, with wins going to Vince Tierney (650 Norton, Senior B), Dave Pawson (BSA, Junior B), and Peter Highland (Yamaha, Junior C and Senior C). As always, the sidecars put on a thrilling display, with Lindsay Urquhart defeating Ray Foster and Ron Hempel to win the Junior GP in an all Norton finish, with an identical result in the Senior Sidecar GP. Foster set up the first sidecar lap record at 1.25. Finding a date on a crowded calendar wasn’t easy, but a second meeting at Winton took place in September 1963, but there were no lap records as the entire meeting was conducted in very wet conditions. However this negated the power advantage of the bigger bikes and produced some surprise results, with Ken Rumble, Len Atlee, Steve Oszko and Bill Barfield all taking double wins. It was Ron Angel who captured the feature race, the first running of the Tom Phillis Memorial Trophy, leading all the way. 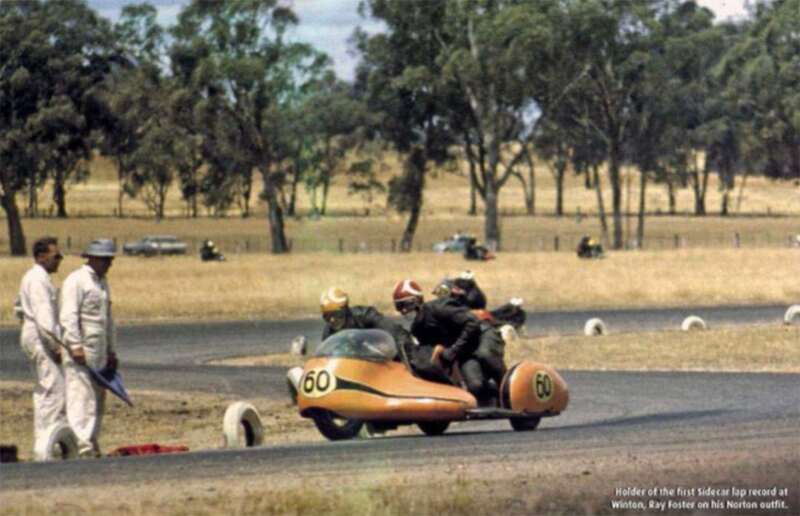 Allan Osborne scored the first win for an Aermacchi in Australia with victory in the 250 race, while Barry Thompson won the Sidecar race by inches from New Zealander Bill Russell. Winton secured the Victorian Gran Prix for New Year’s Day 1964, and the event would become a regular fixture at the track, as did the Tom Phillis memorial. 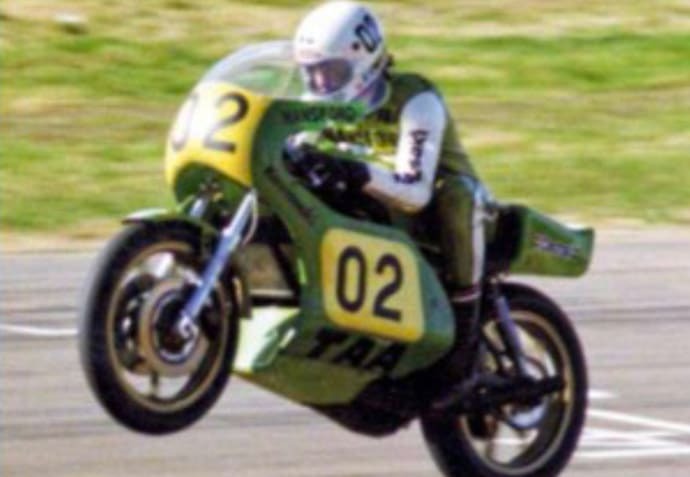 Winton can also lay claim to pioneering Historic motorcycle racing in Australia, staging the first-such event in March 1973. 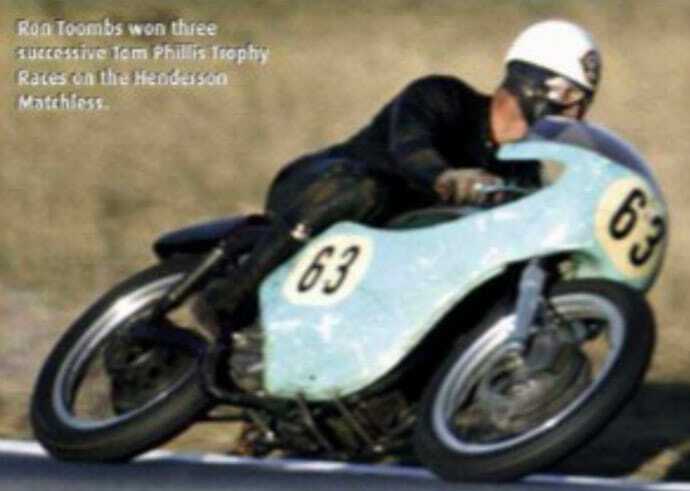 The race was sponsored by Australian Motor Cycle News and won by Peter Hern on a 350 Velocette. “I was lucky enough to cross the line first in that inaugural classic race at Winton” says Peter. “It was run as a handicap event and as I was about to tip into Turn One after getting the chequered flag, my friend Clint Bradley on a Manx came past. One more corner and his name would have been on the trophy. Peter Lord and Derek Pickard put a lot of effort into getting that first race organised.” The AMCN trophy race became a regular fixture and stayed on the program for several years, with the boom in Historic racing resulting in the All Historic Winton meeting that began in 1976, featuring 9-time World Champion Mike Hailwood as the guest star. Hailwood rode a 500 Manx Norton belonging to Charles Edmonds, Historic Winton celebrated its 41st anniversary in 2017, making it the longest running event of its type in the world. As the eighties dawned, Winton was echoing to a new sight and sound – Superbikes. The class had grown in leaps and bounds and by the middle of the decade would take over as the premier class in the country. But the early action was centred around the Victorian circuits at Winton and Calder, drawing big crowds to watch the heroes wrestle with the monster machines on tyres that struggled to keep up with the horsepower. Robbie Phillis on the Mick Hone Suzuki, Andrew Johnson on the Syndicate Kawasaki, Scott Stephens, Paul Freeney, Malcolm Campbell and the official Honda team of Dennis Neill, Mick Cole, Alan Decker and Roger Heyes, thrilled spectators with elbow to elbow racing around the tight track. For four years, Phillis claimed the series title, which received a major boost in 1984 with the backing of insurance firm Western Underwriters. The Albury rider had already sealed his fourth series win by the time the series concluded at Winton in November, where Campbell cleaned up on the day. One year later at the same track, Campbell sealed the title in a crash strewn contest that saw Len Willing as the day’s top scorer. Perhaps the most significant motorcycle race ever held at Winton – at least in name – was the Australian Grand Prix, which took place on the weekend of October 31st – Nov 1st, 1987. 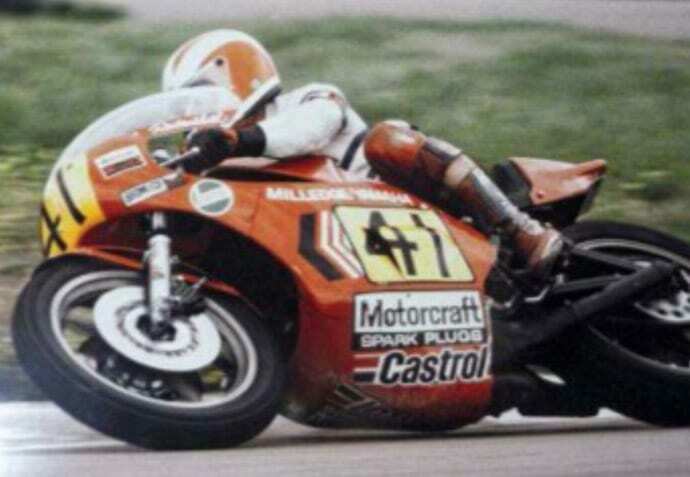 Wayne Gardner had just secured the World 500cc Championship, and Australia was going GP mad at the prospect of holding a round of the championship in 1989. There was much manoeuvring going on as to where such an event could be held, and who the promoter would be. The ACCA was lobbying for a revamped Calder Park, Motorcycling Victoria wanted Sandown, and a separate entity, Barnard project Management, headed by Bob Barnard, who had constructed the Formula One circuit in Adelaide, wanted to rebuild the crumbling ruins of Phillip Island. To prove their bona fides (and to demonstrate to the FIM that their submission was superior), BPM undertook to promote the Australian Grand Prix, which in recent years had become entrenched at Mount Panorama, Bathurst. BPM spent a considerable amount of money in the lead-up to the event, and even organised a helicopter to pick up Gardner and his fiancé Donna Forbes from Melbourne Airport and fly them to Winton, where the new World Champion demonstrated the new Honda VFR750 – the only one in existence. Three temporary grandstands were erected around the circuit in anticipation of a bumper crowd, who would also be treated to an air demonstration featuring the only flying Spitfire in the country. On the race weekend, the temperature soared, reaching 37 degrees on the Sunday, and the spectators stayed away in droves, despite an excellent entry with riders eyeing the substantial prize money on offer. 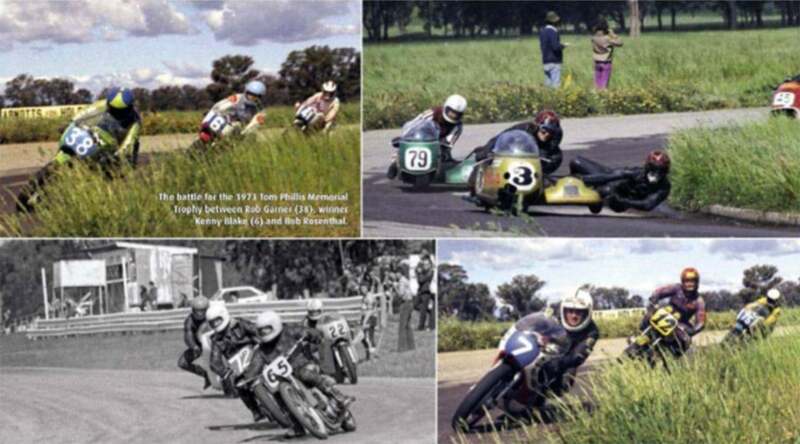 The title races began with the 125cc GP, which was a closely fought contest between Peter Galvin, Andrew Palmer and Trevor Manley. Having just snatched the lead the slippery track claimed Palmer, leaving Galvin’s single cylinder Honda to take the flag from Manley’s MBA twin and Peter McFayden’s Honda. Run over 30 laps, the 250cc GP brought together veteran Jeff Sayle, Donnie Osborne, and Hamish McNicol and Martin Renfrey – the last two aboard ex-works RS250 Hondas previously raced by Kork Ballington in USA. After a race long battle, Sayle took the win by centimetres from Renfrey with McNicol third. 27 outfits faced the starter for the Sidecar GP, another 30 lapper, and after an early scrap between Gavin Porteous, Andre Bosman and Doug Chivas, but after a string of retirements, Porteous was left with a handy lead. 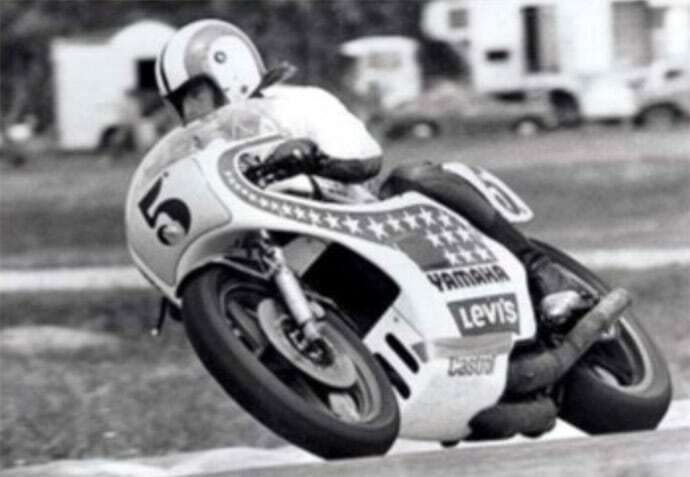 However the heat and leaking fuel soon pushed Porteous to the point of near collapse, and his big lead evaporated with Barry Ditchburn through to the front, then just metres from the line, losing second place to the West Australian team of Hibbert / Allain. That left the premier 1000cc GP, with Kevin Magee on the Marlboro Team Yamaha missing some skin after a practice crash. Pole sitter Robbie Phillis led from the start and after a brief battle with Malcolm Campbell, held the lead until displaced by Magee, who was seeming unaffected by the stifling heat and set the fastest lap of the meeting at 1.01.7 on his way to a clear win over Phillis with Campbell third ahead of Sean Gallagher. Kel Carruthers 250-4 Honda in the pits at the opening meeting for motorcycles. Winton remained substantially unchanged until 1995, when the BAC undertook a $500,000 upgrade, with a new surface and some sections of the circuit widened. Two years later, a major redevelopment took place with a new loop adding almost one kilometre to the lap, taking it to 3.0km (although the original circuit could still be used), and the entire track resurfaced. For the new layout, which turned left at the end of the back straight prior to what had always been known as The Esses, the start/finish area was moved, and pit buildings gradually erected. The new circuit is known as the Winton National Circuit while the original layout is called the Winton Club Circuit. In June 2005, an arsonist set fire to the old race control tower that had stood since the early days, destroying the structure. After some years away, the Australian Superbike Championship is once again a regular fixture at Winton, and the circuit is heavily booked on most weekends of the year for a wide variety of motor sports, vehicle testing and corporate functions. And in terms of Historic Racing it seems the track has many more episodes in store. Typical first corner Superbike action from 1981, with Chris Oldfield (03), Scott Stephens (74), Paul Feeney (42), and Robbie Phillis (32) in the fore. Action shot by Rob Lewis from 1981 with Paul Feeney and Robbie Phillis hard at it.